Nozomu Itoshiki is depressed. Very depressed. He's certifiably suicidal, but he's also the beloved schoolteacher of a class of unique students, each charming in her own way: the stalker. The shut-in. The obsessive-compulsive. The girl who comes to class every day with strange bruises. And Kafuka, the most optimistic girl in the world, who knows that every cloud has a silver lining. For all of them, it's a special time, when the right teacher can have a lasting positive effect on their lives. But is that teacher Itoshiki, a.k.a. 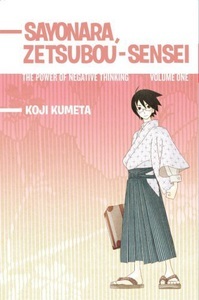 Zetsubou-sensei, who just wants to find the perfect place to die?